Bogotá D.C. is the capital of the Republic of Colombia which is located in the northern part of South America between Panama and Venezuela, to the North and to the South it shares borders with Peru, Ecuador, and Brazil. 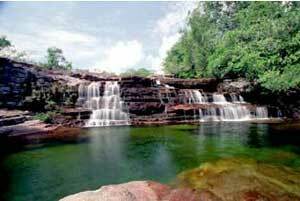 The Colombian territory covers an area of 1,300,000 square kilometers. 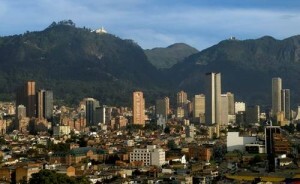 Bogotá, the capital city of Colombia, boasts more than 10 million inhabitants. We are talking now with Alma Taylor-Forbes from Colombia. 1.What is an average year-round temperature in Bogotá? 1.When did you visit your own country last time? 1.Is it safe there now and then? As with such big population as in New York city, Madrid, Geneva, Oslo, in Bogotá the problems start, don’t they? Colombia is a country that has suffered a lot due to two problems that hinder the country’s development: drug trafficking and the guerrilla movement. 81% of the total Colombian population repudiates and abhors these two blights. What is your attitude to these groups? 2.Disgusting what it happens in those days and now, kidnapping etc. The situation about security while travelling to Colombia is slowly changing for better. But in 2001 when I visited my family as my Dad died of heart attack at age of 69. 1.Does your family still live in Bogotá? 1.How about your Mom? First, what is her name? And how does she live in Bogotá? 2.My Mom’s called Itala (originated from “Italian”). She is now 74 y.o., lives in an apartment together with the widow of my brother. Two women get along nicely. We don’t believe in nursing homes. 1.Neither do we, Russians. My mother stayed with me til the day she died at age of 78. 2.Colombians have big respect for their seniors and keep them at home. My Mom is always busy helping people in the community, she raised up 5 children and now has 12 grandchildren and 2 great grandchildren. We love our mother very much and are proud of her. Let Itala live longer years to come! 1.Coming back to the geography of Colombia, what can you say, Alma, about it? 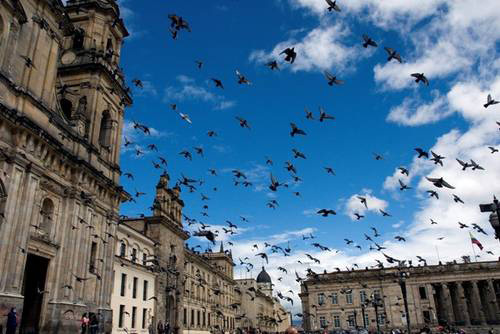 2.In Bogotá there is colonial and modern architecture mix magically. Churches, Museums (for, example, Gold Museum (pre-Hispanic gold work). What it makes special is Colombian air because it is geographically situated in a plateau surrounded by the Andes Mountains at 2400 km above the sea level. The air is thin and is wonderful to breathe with. 1.Yes, compared to Calgary which is located at approximately 1400 km above the sea level, one can feel a big difference. We know it for sure when we climbing up in Fairmont resort high in the Mountains. The air is unforgettable, you’re right, Alma. 2.Otherwise I can say about rivers. Near Bogotá they are all polluted because of heavy industrial wastes to be put there. Farther down, in jungles. there is another picture. Let us look at the slide show “Cano Cristales”? which is full of mineral waters. They say, they are healing people. 2.The picturesque landscapes go side by side with good-hearted people, open and hospitable. Right after the first and second World Wars, lots of immigrants came here. Food prices are not so high, nor the residential prices. 1.Maybe because of that there are organized annually in Bogotá the shows “Miss Universe”, aren’t they? What do you think, Alma? 2.My personal opinion about these shows is negative. Why? I’ll explain why. I don’t like the money making attitude to those pageants. The young beautiful women are being used and sold for money. I do not like this attitude. And certain demands are pushed on them (using extra make-up etc.) Where is the natural beauty of the Colombian women? 1.You’re right,Alma. Advertising companies are using them. On the other hand, maybe the girls don’t mind? One Cannot Ban to Live Beautifully or What is the Price of Bagels?